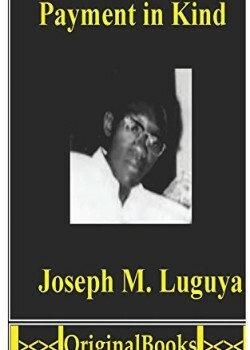 Payment in Kind by Joseph M. Luguya is a novel that centers on Africa, yet takes readers on a journey both geographical and psychological, exploring complex issues of culture, politics, religion, justice and race. The novel is told in several layers, each complementing the other, in a highly ambitious structure that excels in keeping the reader’s interest. In summary, the author’s unique point of view, extensive familiarity with his subject matters and a talent for lively storytelling combine to create a realistic novel that spans across borders, oceans and continents, yet succeeds in remaining solidly anchored in the lives of interesting, genuine, flesh-and-blood characters. Highly recommended!